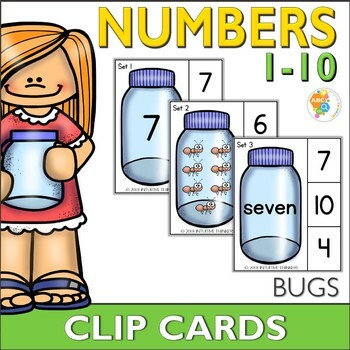 Bug Number Clip Cards provide a hands-on approach in helping children with number and number word recognition along with cardinality. 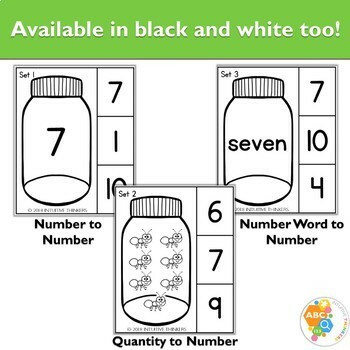 This resource focuses on numbers 0-10. 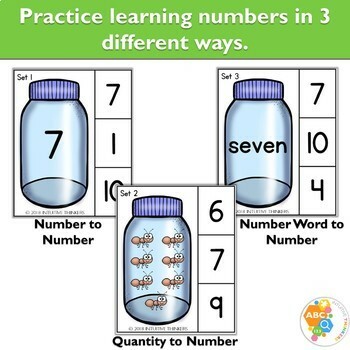 (number, number words, and quantity). ❶Match the number, number word or quantity in the jar to the correct number in the squares. ❷Clip the number with a clothespin or cover with an object or your choice. This resource is a perfect way to review numbers in a math center, small group, 1-on-1 or independent setting! This would be a great addition to your preschool, pre-k, kindergarten, or special education class. Parents, this would also be a fun activity to incorporate in your tot schooling or homeschooling curriculum. Activity mats are easy to prep and can be used year after year! You will need to print on cardstock and/or laminate all pages for longer durability. Click the green preview button above to view sample product pages.